Each year in May when I make my annual pilgrimage to the Indianapolis 500 – a near-religious experience – my journey takes me through the Champagne-Urbana, Illinois region. There, in recent years, I've taken that opportunity to meet with friends from the area. We have lunch, share the experiences of the past year, exchange ideas and maybe even tell a tall tale or two. Freemasons all, the conversation usually has a lot to do with the state of the Craft, whether in our local lodges or with other Masonic issues in general. 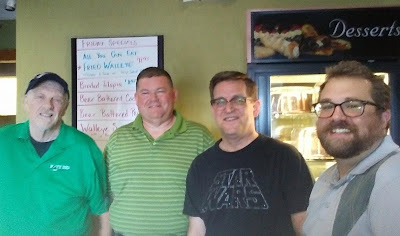 Our small group consists of Todd Creason, Greg Knott, yours truly and this year, for the first time, Darrin Lahners joined us. While Freemasonry struggles with membership issues, our exclusive “order” has grown by 33%. Todd is the founder of the Midnight Freemasons blog. He has written a slew of books on Freemasonry including three novels where some of the characters are Brothers, and has been named a Fellow in the Missouri Lodge of Research. Greg is a Past Master of St. Joseph Lodge 970 in St. Joseph, Illinois and is a director of the prestigious Masonic Society. Darrin just served as Master of St. Joseph Lodge 970 and this coming year will be Master of Homer Lodge 199. Darrin has written about some tough issues he faced as Master this year and the fact he's out to do it again at Homer emphasizes his dedication to the fraternity. That doesn't even serve as a “Reader's Digest” version of what these men have accomplished. Their full biographies can be found at www.midnightfreemasons.org/. These Brothers are so dynamic, enthusiastic and have had so many successes I'm sometimes surprised to find they run into the same issues I encounter; but they do. We share those issues and try to work out what solutions and suggestions we can in the space of an hour or so. I really look forward to this little get-together. It's nothing earthshaking. We're not going to solve the problems of the world in the small amount of time we have. Maybe its greatest significance is there are three – make that four guys – different ages, different backgrounds, different geographical regions getting together. If not for the bond of Freemasonry this wouldn't happen. I wouldn't know any of them and, although Darrin, Greg and Todd work at the same place they wouldn't know each other as well or perhaps at all. I've seen this kind of thing happen a lot. We are a band of Brothers with common experiences and obligations. Knowing we share the tenets of Freemasonry brings us together like magnets. Just seeing that square and compasses pin on a lapel makes us want to know more about the man wearing it. It's not just a conversation piece; it represents the strong bond of Brotherhood. That is until next year, God willing. What - you come to Indy every year and you never call, you never write? Call a person next time. I can show you around. Cause I know people.